Participants included Maj Chris Johnson, Maj Maggie Wang, 1st Lt Gabriel Fletcher-Hernandez, Maj Jeff Ironfield, Capt Luis Rivas. The DRE enabled many of the recent graduates of the Airborne Photographer (AP) Ground School to complete their training requirements and become APs. The AP rating is not an easy one to achieve, and this DRE didn’t make things any easier: According to Maj Wang, AP Trainees faced a “tough curriculum and a tough flight” with fairly windy conditions. 1st Lt Eric Choate represented Squadron 188 at the San Carlos Airshow on 27 June. The squadron also held a BBQ on the 5th Tuesday of June. Capt Jordan Hayes served as Air Ops Branch Director (AOBD) for this mission. Maj Noel Luneau, Maj Steven DeFord and Lt Col Roger Glenn were among those participating in the prosecution of several ELT missions. Maj Ironfield completed his Planning Section Chief (PSC) rating. Capt Doug Ramsey received his ES patch. 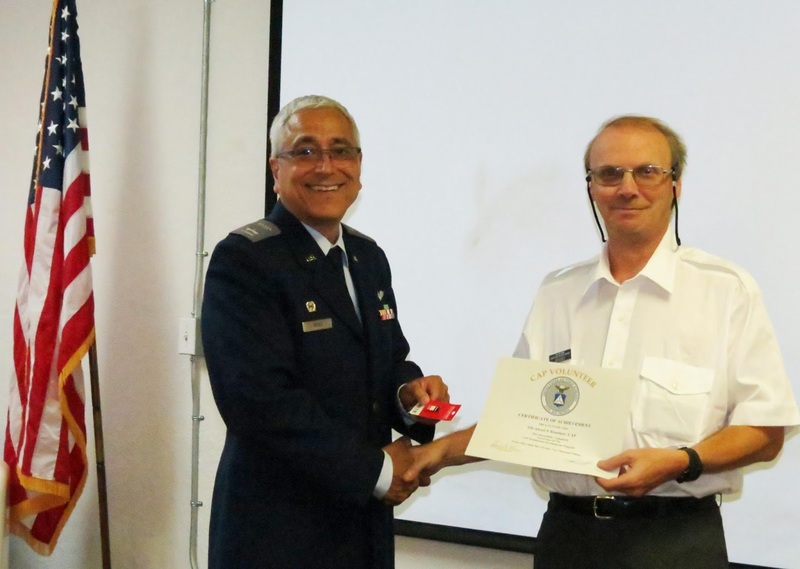 Capt Georgios Michelogiannakis completed his Senior Rating in Standards & Eval. Maj Luneau received a Rescue Find Ribbon, with a Bronze Clasp, and received his Incident Commander 2 (IC2) badge. SM Alexei Roudnev and SM Nikolay Zherebnenkov both received their Level 1 Membership awards, and SM Zherebnenkov received the Yeager award. *** This now brings our squadron to 90% achievement rate of the Yeager (Charles E. “Chuck” Yeager Aerospace Education Achievement) award. If you haven’t completed this training yet, please do, so we can get to 100%. Thanks to the dedication of all our squadron members, Squadron 188 has now achieved 100% completion in Cadet Protection Program training. So far this year, our glider usage has reached 100% of goal, (200 sorties, 100 of which are cadet O-Rides), thanks to all glider pilots and those donating their time to give O-Rides to cadets. Two Squadron 188 members (1st Lt Robert Kraus and 2d Lt Tim Roberts) will be students at the upcoming Mission Aircrew School (MAS) Ground School portion, held at KOAK July 11-12. The second half of the MAS will be held July 24-26 in Fresno. 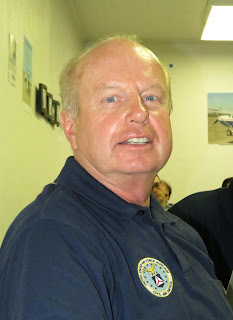 You must attend the Ground School portion in order to participate (as a Trainee) in Fresno. There will be a Group 2 / 5 DRE held on August 29-30. Details will be forthcoming. This DRE will focus on advanced aircrew and ground tasking and is primarily for standards, not trainees. If you can, please consider attending the CAWG Wing Conference, held in Newport Beach at the end of September. 1st Lt Pat Bitz presented an AEX educational session on the New Horizon spacecraft that was launched 9 years (19 January 2006!) ago from Cape Canaveral and has just now reached the dwarf planet Pluto, for a first-time (by humans…) exploration. NASA is holding a public information session on 14 July about this historic event. The first post-flyby, close-up images of Pluto and moons are scheduled to be released on 15 July and will be available on the Ames website. New Horizon will pass within 7,800 miles of Pluto’s surface. By comparison, at the same distance over Manhattan, the spacecraft’s sensors could pick out all the little ponds and lakes in Central Park. More information provided by NASA can be found by clicking here. Lt Bitz showed a great video about the mission, which you can also view by clicking here. In an upcoming AEX session, Lt Bitz will demonstrate the use of the squadron’s telescope, which we received from CAP as part of a STEM kit. Details when we find out more! It's BBQ season, so food is this months' safety topic. 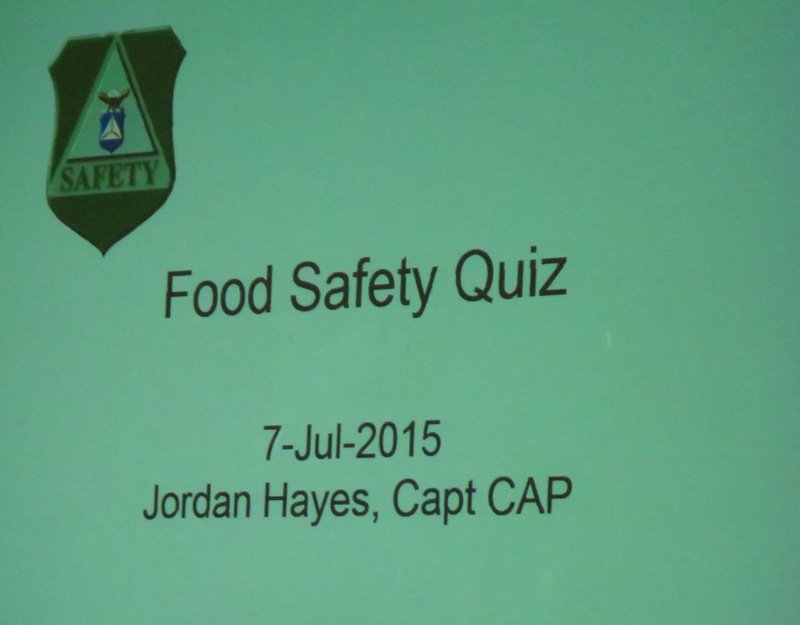 Capt Hayes led the squadron through a Food Safety Quiz for this month’s safety presentation. Do you know how long it is safe to keep cooked food out at room temperature, or whether you can salvage part of that loaf of bread when one piece of it is moldy? No? Well, if you had attended the meeting, you would know! Squadron members were also alerted to the fact that reg 62-1 has been updated, removing safety currency requirements from event participation. Despite this, squadron members are expected to participate in safety briefings and, of course, to maintain safety as a first priority in all CAP activities. 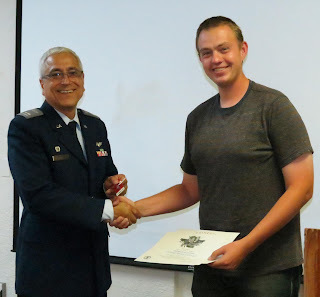 Civil Air Patrol, the official auxiliary of the U.S. Air Force, is a nonprofit organization with more than 61,000 members nationwide. CAP, in its Air Force auxiliary role, performs 90 percent of continental U.S. inland search and rescue missions as tasked by the Air Force Rescue Coordination Center and was credited by the AFRCC with saving 113 lives in fiscal year 2010. Its volunteers also perform homeland security, disaster relief and drug interdiction missions at the request of federal, state and local agencies. The members play a leading role in aerospace education and serve as mentors to the more than 26,000 young people currently participating in CAP cadet programs. CAP has been performing missions for America for 69 years. It is the largest sponsor annually of Wreaths Across America, an initiative to remember, honor and teach about the sacrifices of U.S. military veterans. For more information on Civil Air Patrol, visit www.gocivilairpatrol.com or www.capvolunteernow.com. LINKS OR REFERENCES TO INDIVIDUALS OR COMPANIES DOES NOT CONSTITUTE AN ENDORSEMENT OF ANY PRODUCT OR SERVICE YOU MAY RECEIVE FROM SUCH SOURCES.